This section we call “Sidereal” in preference to the more dramatic term “Deep Sky” in current usage. It will be seen that our images are all single exposures, unlike the stacked composites of many images obtained with dedicated CCD equipment The latter requires linkage to a computer in one shape or form and for practical reasons this is difficult with the set up we have on Rousay. For smaller objects (less than around 15 arc-minutes) imaging with a large telephoto lens via a digital SLR cannot compete for detail with the more sophisticated CCD. What the “stand alone” method offers is something portable that can capture a wider area of sky with shorter exposures. This is essential for locations such as Orkney where one is seldom afforded the luxury of long periods at the instrument. The point to note is that large, quality manual telephoto lenses may be purchased today at a fraction of their original price since most professional photographers go for the latest, fully automatic versions. The M31 (Great Andromeda) triple galaxy system. M31 is the only external galaxy in the northern celestial hemisphere visible to the unaided eye. 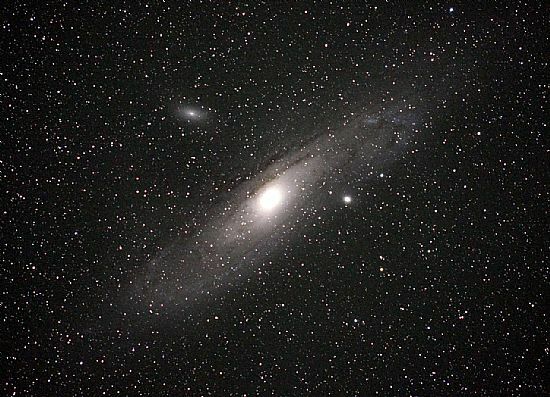 The two satellite galaxies M32 and M110 attending M31 itself have a similar relation as the Greater and Lesser Megallanic "Clouds" have to the Milky Way, though they are clearly quite different in structure from the former. This is interesting since M31 bears a striking resemblance to the Milky Way. M31 etc. 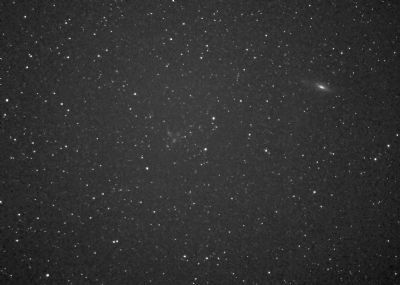 imaged 2016 September 04, 21h 13/14m UT. Nikkor 500mm f/4 & Nikon D300 SLR. A 77.2 sec. exposure ISO 2500. 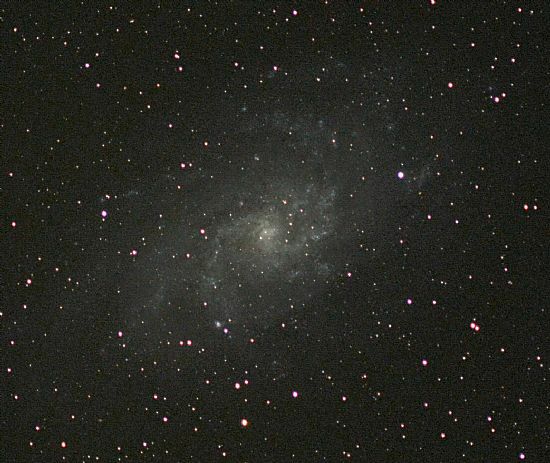 This result is of interest since we used the very basic, small EQ3 equatorial mounting demonstrating that valuable results may be achieved with exposures of the order of 1.5 minutes without noticeable stellar image distortion due to motor drive irregularities and inadequate equatorial alignment. The EQ3 mount is of light weight and should be used with the tripod around half its full extension height in order to minimise vibration from wind. Sky transparency was good at 8/10 with excellent seeing (stability) at the the time of the exposure. The Nikkor 500mm is a versatile telephoto lens being significantly lighter in weight than the 400mm f/2.6 and the 600mm f/4, both of which would tax the EQ3 mount. The equatorial settings were achieved initially using the wide angle, fast 200 f/2 lens and then switching to the larger lens. 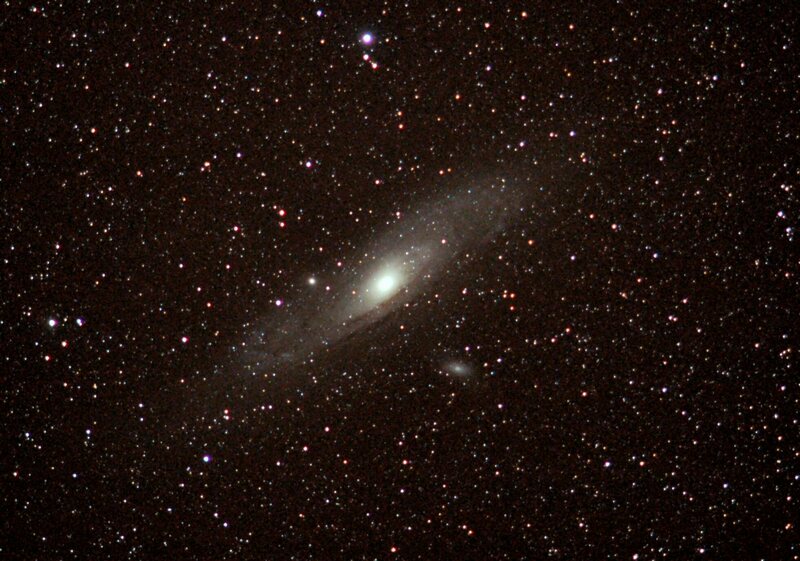 M31 The Great Andromeda Galaxy, with its two satellite galaxies, imaged 2015 September 13, 22h 45m UT. A 71 sec. exposure Nikkor 500mm f/4, D800 SLR ISO 2500. 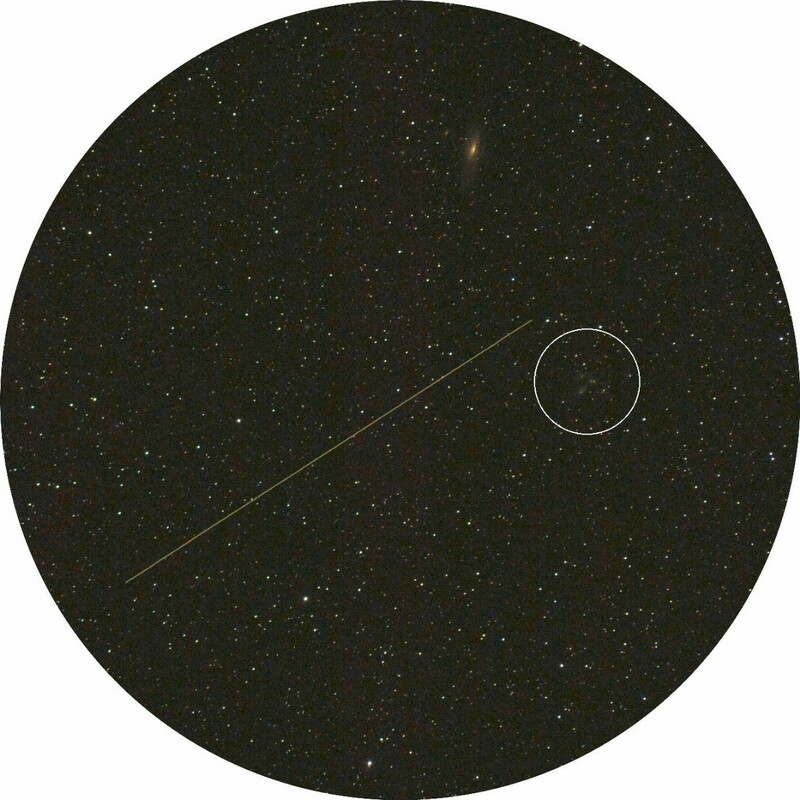 Altitude of M31 at time of observation, 60°. Readers will not need to be told that weather conditions have rendered observations virtually impossible for the past several weeks. 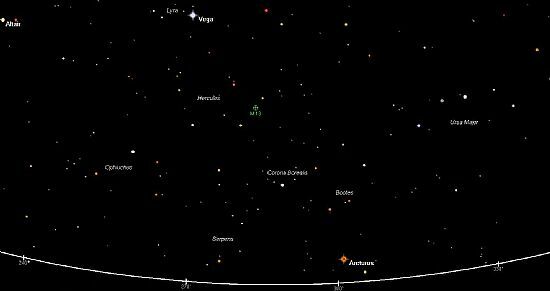 However, the early evening and night of November 26 gave an exceptionally clear three hours making it possible to see stars with the unaided eye to visual magnitude 6.3 within the Square of Pegasus when close to the meridian. 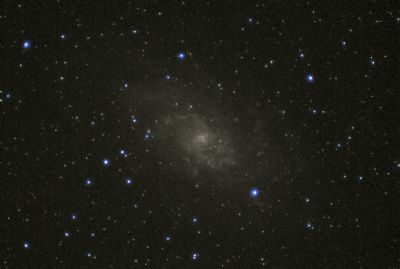 A number of observations were made using the Nikkor 800mm f/5.6 and D300 SLR in which stars to magnitude 18 were recorded and galaxies to magnitude 16. A 70 sec. 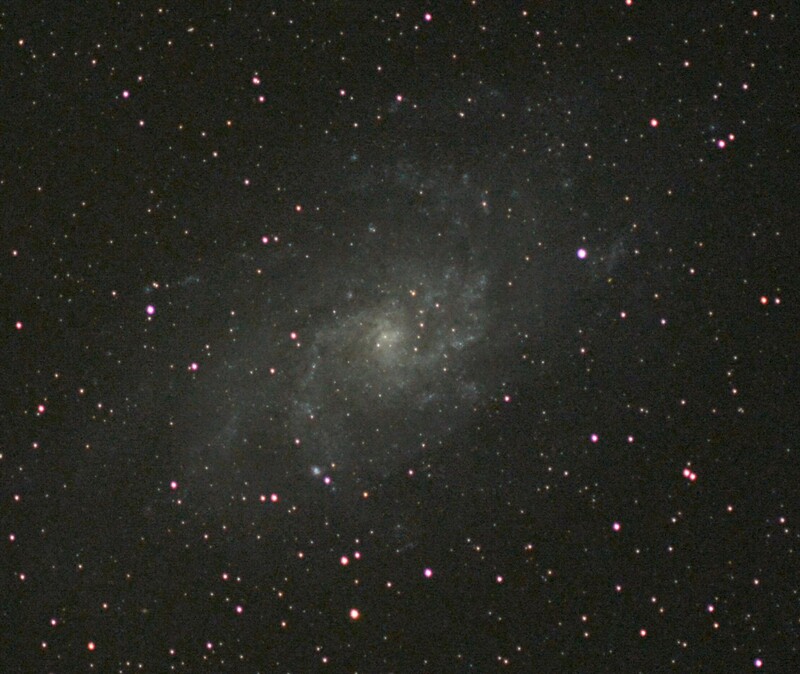 exposure for M33 is given below. 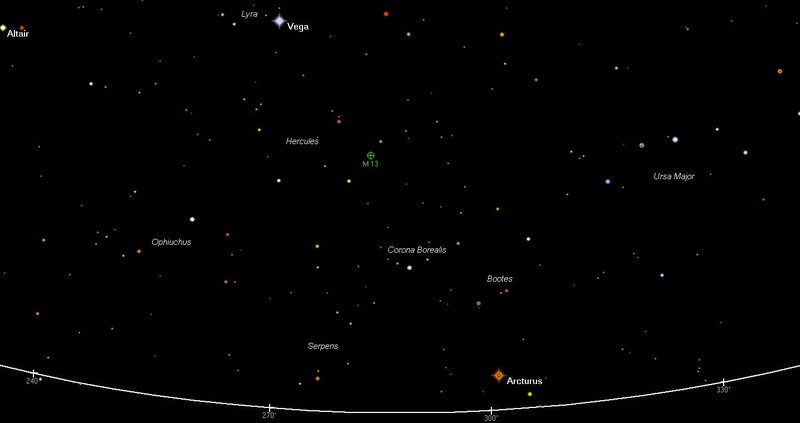 *So named because the galaxy in appearing close to the bright star Beta Andromedae and named Mirach (there are various spellings) appears as a sort of “ghost” image of that star. The two objects have no relation in space. The star is apporximately198 light-years distant from Earth. 2014 October 15: Galaxies in Pegasus. 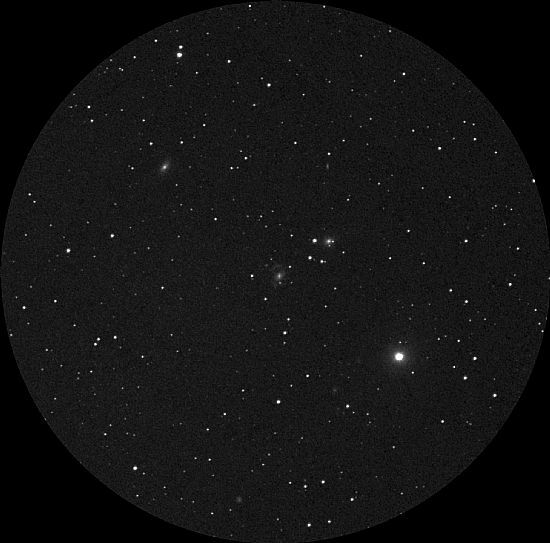 Vermin of the skies: an artificial Earth Satellite marring an image of galaxy NGC 7331 and Stephan's Quintet of galaxies (centre of the white circle). The group is designated NGC 7317–7320. NGC 7320 is in the foreground and is at a similar distance from Earth to the bright galaxy nearby in the photograph NGC 7331. The true (four) members of the group actually associated together in space are at a distance from Earth of approximately 290 million light years. Distance from Earth: 40 ± 3 million light yrs. 2013 October 27, 22h 13m UT. Galaxies in Draco. The region around NGC 4291 (mag. 11.4 size: 2.0'x1.7') and NGC 4391 (mag. 12.0 size: 2.8'x2.1'). Field dia. 54' approx. 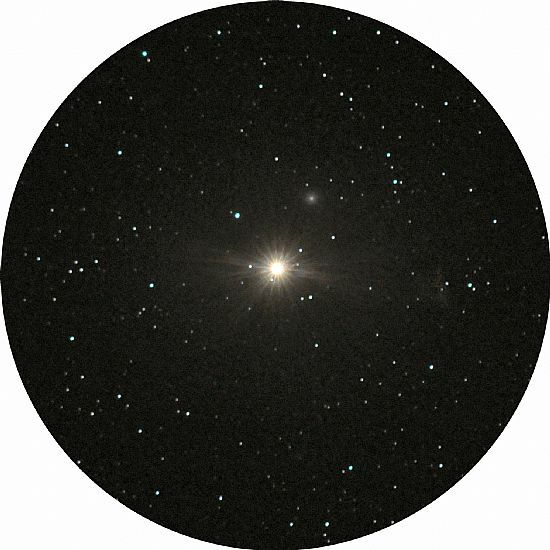 The elliptical galaxy at 10’o clock is NGC 4386 (mag. 11.7 size: 2.5'x1.3'). 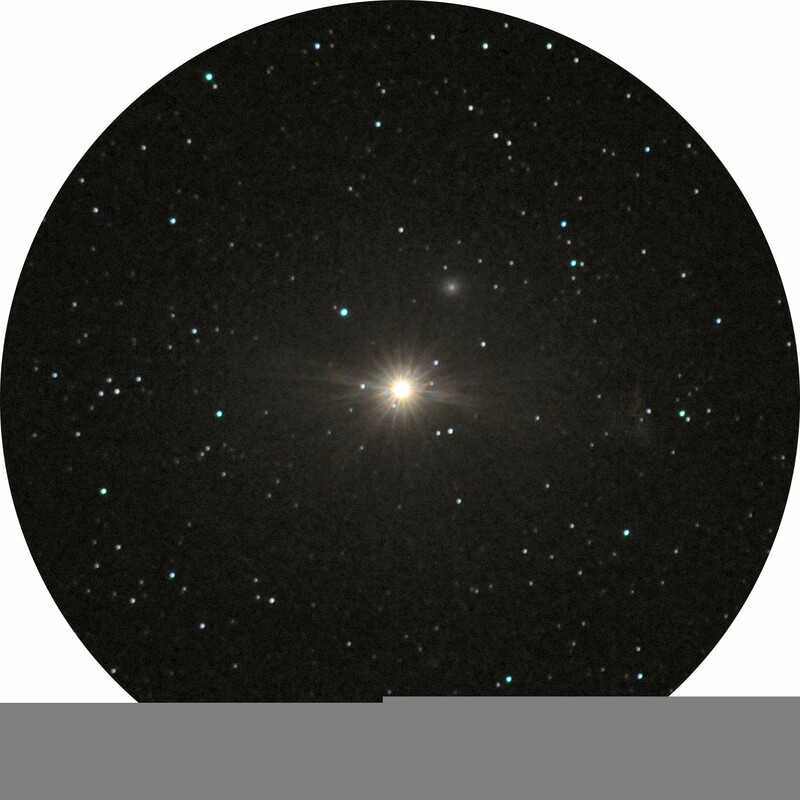 The elliptical galaxy a little above the central group is PGC 39763 (mag. 15.2 size 48.0"x17.0"). A grayscale reduction from an image taken with a Nikkor 600mm f/4 and D800 SLR. A 45 sec. single exposure ISO 1600. 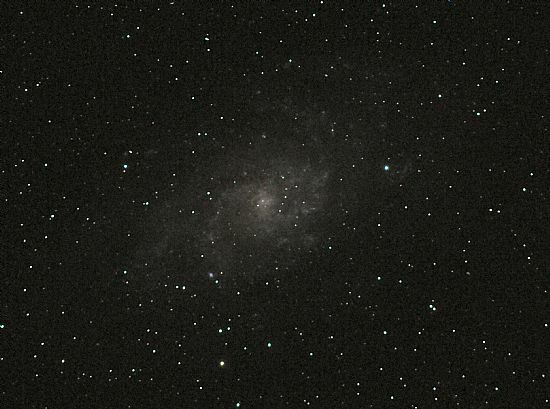 The spherical galaxy at 7 ’o clock is NGC 4363 (mag. 14.0 size: 1.4'x1.4'). 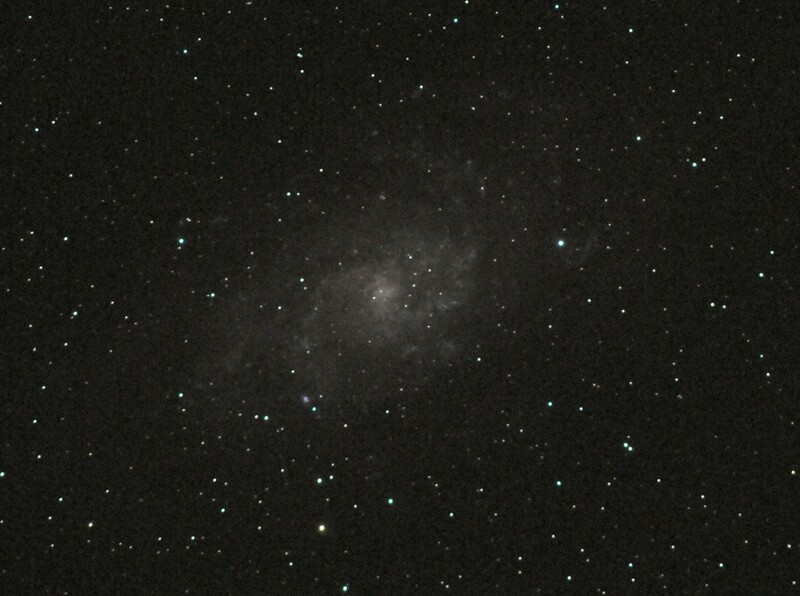 Apparent Dec: +75° 15' 11.7"
M 33 or Pinwheel Galaxy (mag 5.5 size: 68.7'x41.6'). M101 (see below) is also known as “The Pinwheel Galaxy”. Nikkor 600mm f/4 and D800 SLR. A 45 sec. single exposure ISO 1600. 2013 October 27, 21h 35m UT. 2013 October 23: The Great Cluster in Hercules, M13. 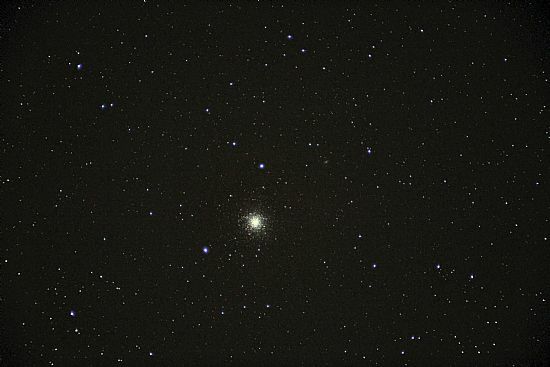 The brightest and most impressive globular cluster in the northern celestial hemisphere. On a clear, dark night, and at a good elevation, this cluster may be seen with the unaided eye as a faint, very small patch of light. M13 was the first Messier object I observed as a young lad of 13 years from the then dark skies of rural Essex. It was discovered by Edmond Halley in 1714. These clusters are members of our galaxy, The Milky Way, and are located within a spherical environment whose centre lies close to the centre of the galaxy itself. M13 is some 25,100 light years from the Solar System, and with angular diameter of a little over 20', this corresponds to a spatial diameter 145 light years. 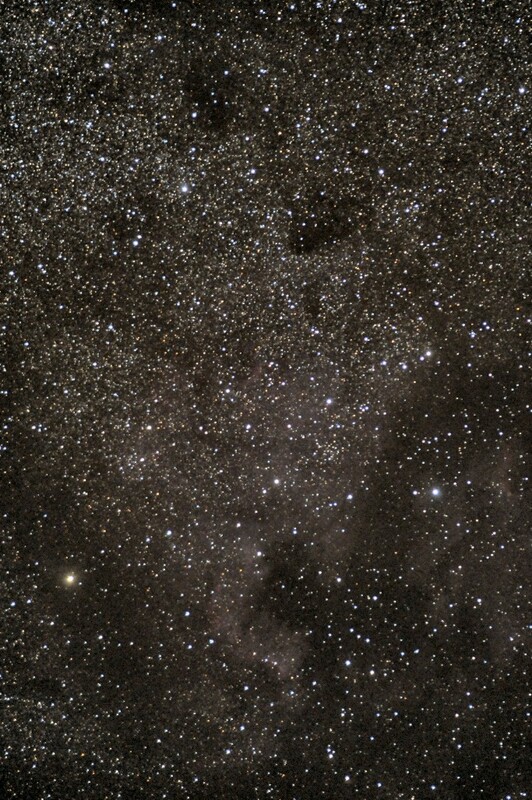 Estimates of the number of stars vary from 100,000 plus to more than 1 million. The age of the cluster has been estimated by various researches as between 17 billon (Arp) and 24 billion (Sandage) years. The actual number of these clusters associated with our own galaxy may be of the order of 200. 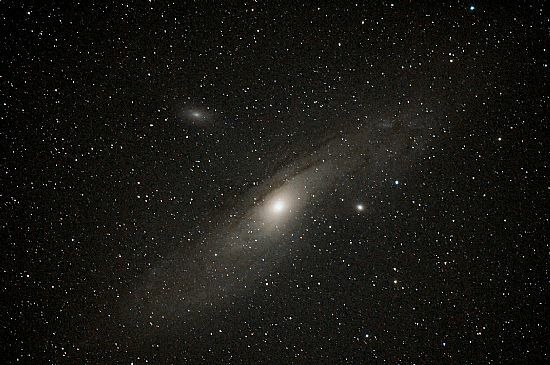 The Andromeda Galaxy (M31) may contain up to 500 of these objects. M13 is not an easy object to photograph without over-exposing the centre at the expense of the fainter, perimeter stars. 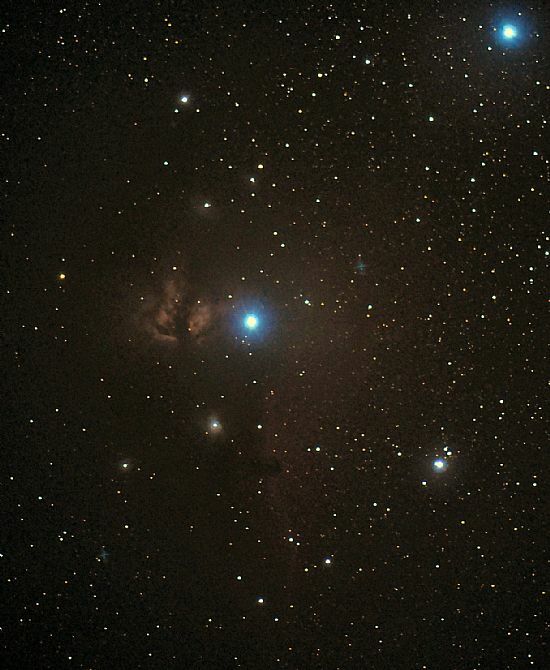 The region of xi Cygni (62 Cygni, brightest star in the field of 2.6° x 4.5° approx.) mag. 3.7, including the so-called North American Nebula, NGC7000. Region in Milly Way including NGC 7000 (North American Nebula) and its associated nebulisites IC5067 - 5070 (Pelican Nebula). This lens was purchased S/H for a mere £300. (The new Nikon equivalent would cost in the region of £3,750 plus). I have tested this alongside Nikon (Nikkor) lenses and found the Tokina stands up well to the comparison. This lens, combined with a S/H D100 SLR and mounted on a motor driven SkyWatcvher EQ3 mount see Archives), would cost in the region of £800. The image of Comet Holmes on the COMET page (with Mirfak) was obtained with this combination. The equipment is therefore capable of potentially useful research (not just for taking pretty pictures), and at a significantly lower cost than a more sophisticated CCD setup. The Double Open Cluster In Perseus (h and chi Persei, or NGC 869). 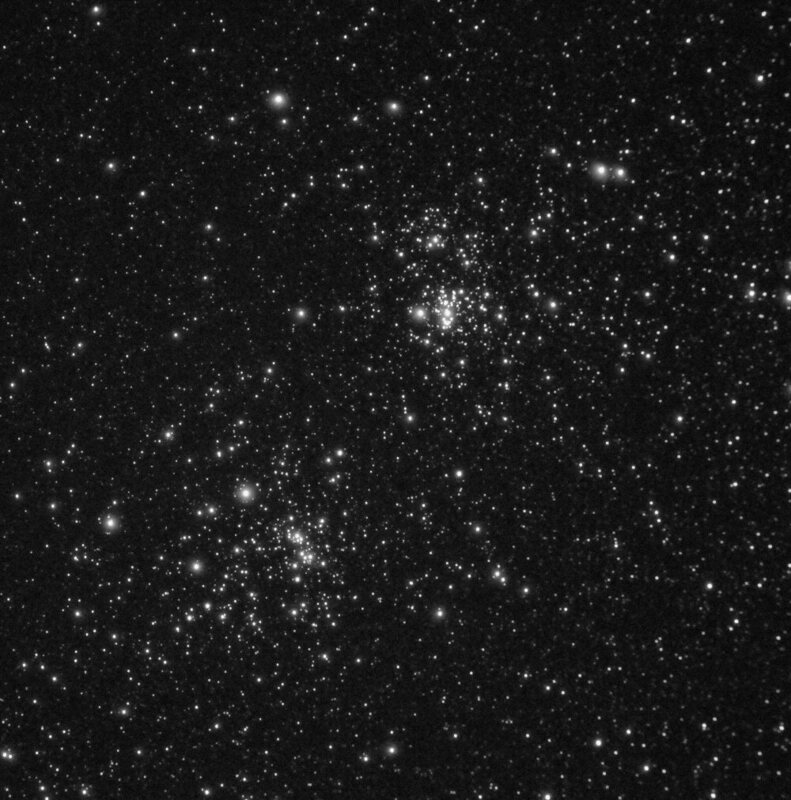 More accurately: Double open cluster NGC 884 (also known as “chi Persei”, integrated apparent visual magnitude 6.1 ), together with NGC 869 (integrated apparent visual magnitude 5.3) in Perseus and both seen as nebulous “stars” to the unaided eye. The region around zeta Orionis. 2012 Janaury 16, 19h 33m UT. A 40 sec. exposure Nikkor 400mm f/2.8, D300 SLR ISO 1600. Seeing steady but transparency only moderately good. 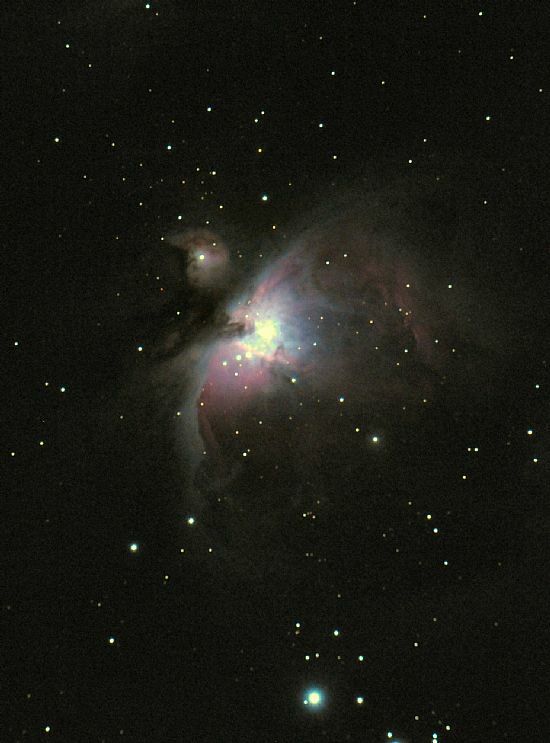 The Great Nebula in Orion M42. 2011 October 27, 150mm f/5 (750mm fl) achromat: A 100 sec. exposure D300 SLR ISO 2000. This galaxy is a member of the local group and is to be seen in the sky a little below the Great Andromeda galaxy M31 (see below). 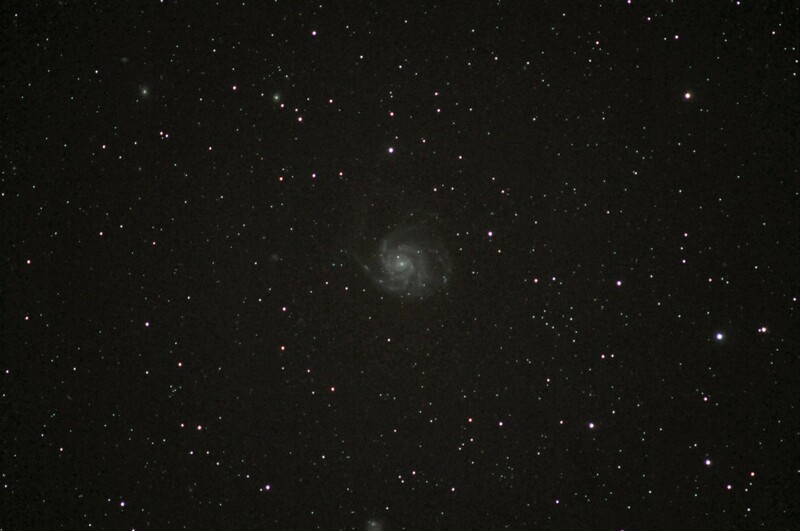 It appears both brighter and larger than M101 (the other, other pinwheel galaxy!) and may be glimpsed with the unaided eye when high in the sky on a dark, clear night. It is not an easy object! 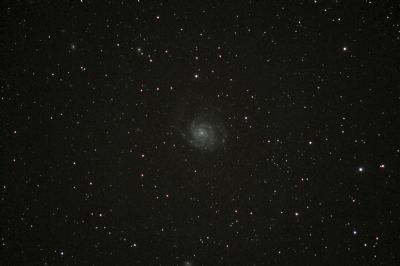 Compare the two images secured on the same night (2011 October 27) under similar conditions and elevations, that for M101 on the Current Topics page and the present one: identical instrument, exposure etc. The image above was secured with a mere 30 sec. exposure using a Nikkor 600mm f/4 lens attached to a D300 SLR working at ISO1600. Even at this short exposure the centre of the galaxy tends to “burn out”. Here film has the advantage over digital. 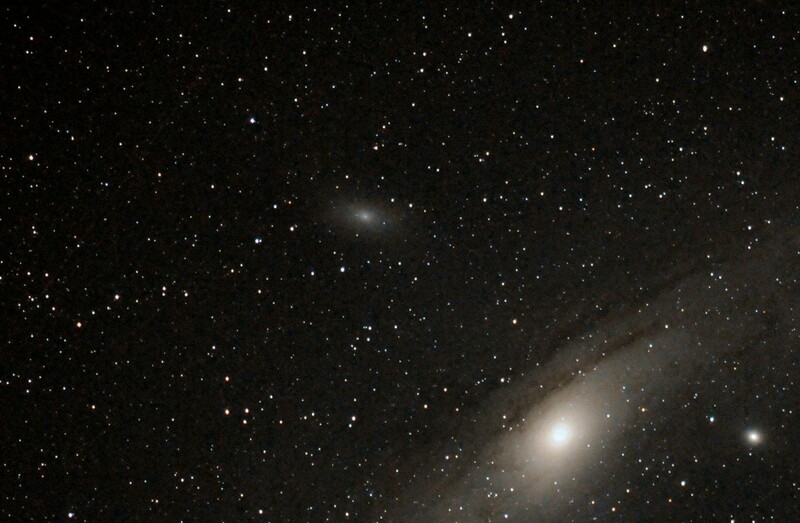 The two companion galaxies are M 32 and M110. 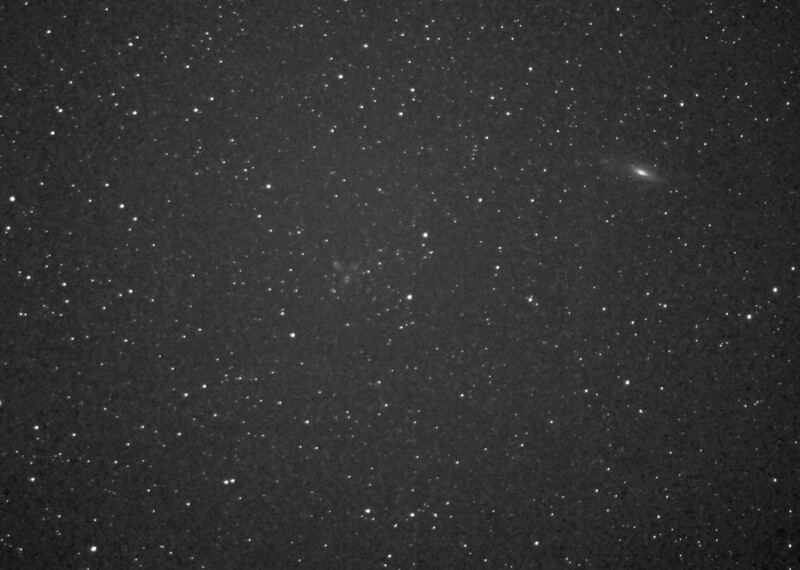 Imaged 2011 September 28, 21h 47m. Even more remarkable in terms of the short duration (20 sec. ISO 600) of the exposure, is the following taken from December 2009 using a Nikkor 200mm f/2 attached to a D100 SLR. 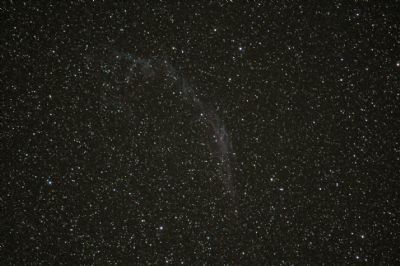 The region around NGC 6992 and NGC 6995 (below epsilon Cygni on the border with the constellation Vulpecula), the so-called “Veil Nebula”, is an extended area covering well over two-arc degrees in diameter. The feature is a super nova remnant from some 6000 or so years back and is a well established radio source within our galaxy, The Milky Way. Imaged 2011 September 29, 00h 01m UT. Nikkor 600mm f4. D300 SLR. A 80 sec. exposure ISO1600. NGC 7320 mag.13.2 (centre) the brightest galaxy in Stephan’s Quintet with other galaxies in the group barely visible (faintest NGC 7317 mag. 14.6). 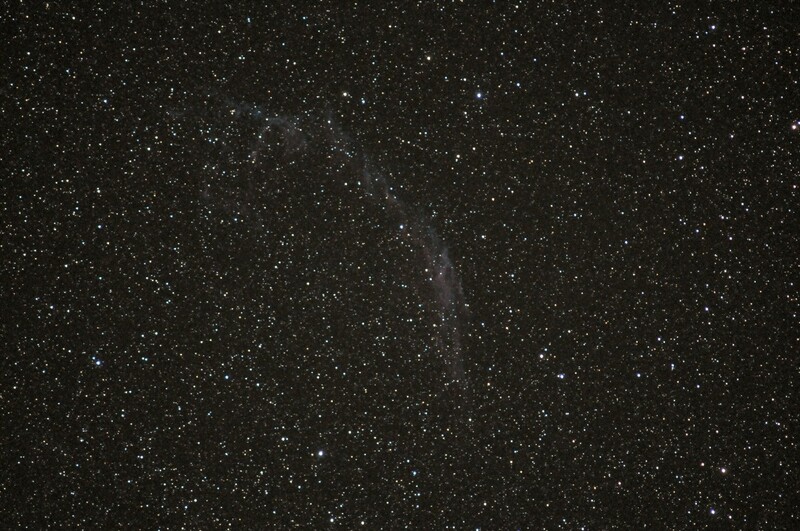 The much brighter galaxy (above right) is NGC 7331 mag.10.3. There are also four faint galaxies close to 7331 (faintest pair at mag. 15.4, all of which are just visible on the original image). Data: 2011 August 06 23h 27m UT. Rousay, Orkney, U.K.
Nikkor 400mm f/2.8 with X2 tele-converter on Nikon D300 digital SLR. A single 100 sec. exposure ISO 800, reduced grayscale. Galaxies in Ursa Major continued . . .
M106 (integrated mag. 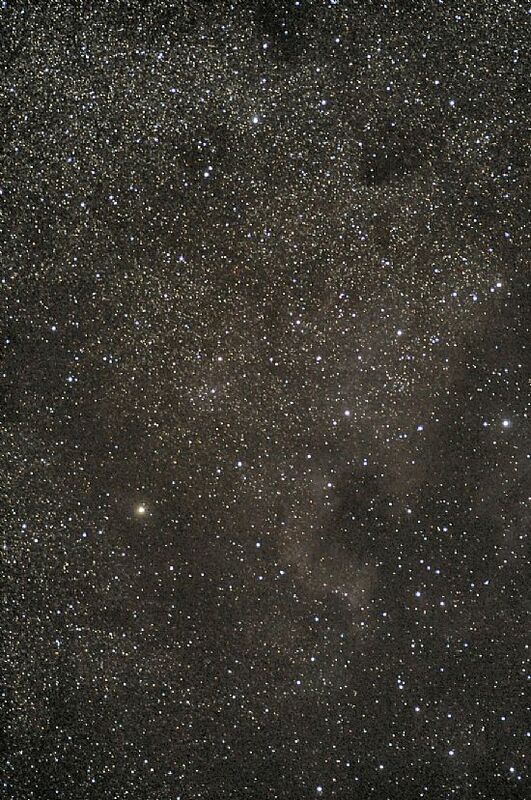 9.1) imaged 2011 March 03, 21h 40m UT. A 4 minute exposure Nikkor 600mm f/4 with x2 converter: D300 SLR ISO 1000. The field is approaximately 1x0.7 arc-degrees and shows many galaxies to magintude 17, including the close pair NGC 4231& 4232 (both integrated mag. 14.5). Nebulosity in the Pleiades Cluster (M45). 2010 December 30, 19h 24m UT. A 30 sec. exposure with Nikkor 200mm f/2 and Nikon D300 at ISO 1200. (Cropped image) JCV. 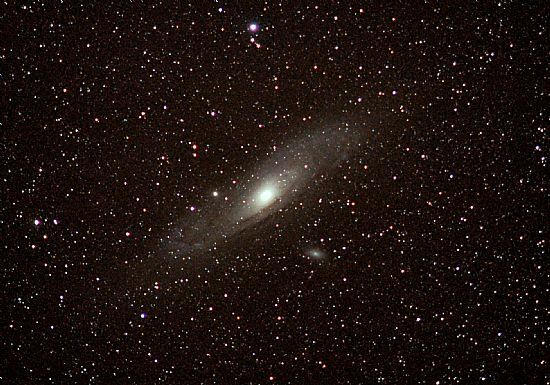 The Great Andromeda Galaxy M31. 2010 December 30 18h 45m UT. A single exposure: no stacking of images!